It's been awhile. I announced the beginning of the renovation of our new fixer upper in the last post, and then I disappeared for 5 months. I'm so sorry I left without warning. 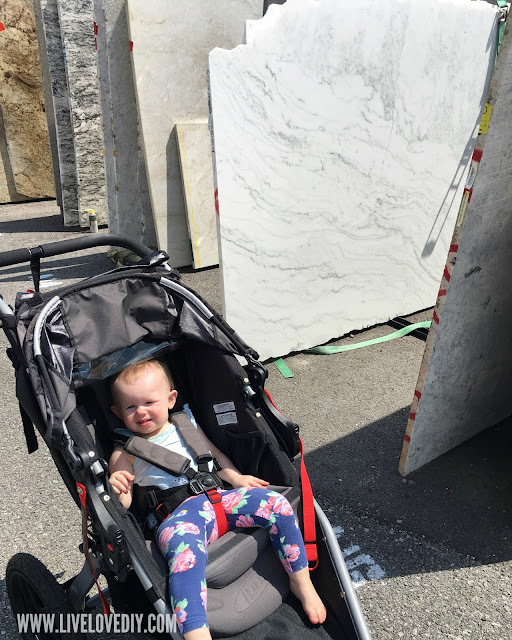 I was trying to keep too many plates spinning at once: running the blog, moving across town, gutting and renovating the new house, and taking care of a toddler all day. I burned out, and I needed to let some plates fall. 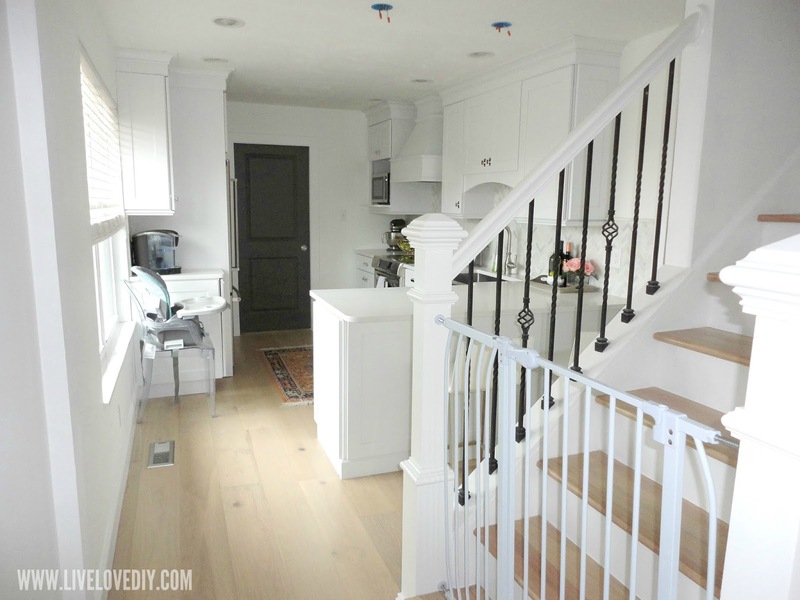 I ignored my blog and instead focused on family and spent my spare energy renovating the house. I've been posting almost daily on Instagram ever since that time, because it takes much less energy to post there, but I know not everyone follows me there, so some of you had absolutely no idea what was going on. I had a reader email me and ask if I was dead. I am not, but I appreciate the concern. Anyway, after the house renovation was finished (at least the big stuff...I'll be working on little projects forever), I started to feel excited about blogging again. I had been spending every single evening as some sort of nighttime construction worker, so once I was done with that phase of life, I had energy for something else. So, I'm back. With tons of pictures and stories to share about everything that happened while I was away. And I'm going to start with the kitchen makeover. The kitchen is my favorite place in the house, and the project that gave me the most anxiety. I've screwed up so many things in the past (namely, having to rip up our floors, twice. ), so I was beyond anxious. Plus, when we bought the house, the existing kitchen was just totally not my style and I would sometimes stand there and stare at it and sweat. I felt like no one understood my vision for it. Not a single person told me that, but I projected it onto anyone who would make eye contact. So, now that it's done, and I feel like my vision has come to life, I'm pretty excited. It was a hard project. I've never had the ability to just gut a kitchen and start from scratch, so it was also a lot of fun. Like, gave me diarrhea and also SO MUCH FUN! So, this is what the kitchen looked like the day we moved in. I remember being so stressed about it. It felt like a cabin. Which is great if you're in a cabin. Just so much damn orange. Remember how we lived with a mini fridge? For months? I was putting off buying a fridge until I knew what we needed, and it took a lot longer than anticipated to get everything moving on the reno. The general mood around this time was 'just kill me now'. Here's the view from the living room looking into the old kitchen. I just can't with the textured walls. So, that's what where we started. 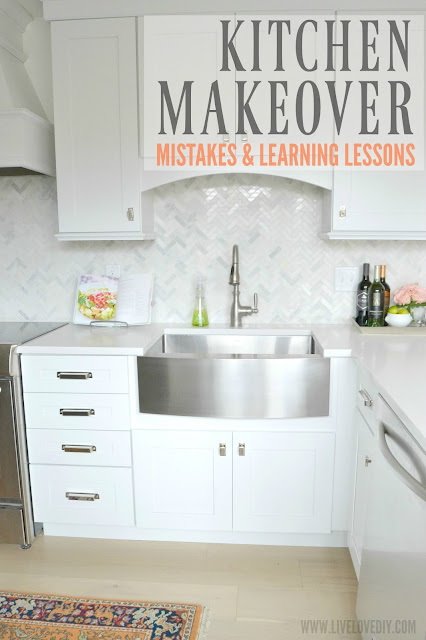 Now, let's talk about the actual kitchen makeover. We hired a general contractor (who had done a couple houses for my friend) and he handled the kitchen reno, resurfacing all of our ceilings, building the missing doorways (refresh your memory here...the doorway issue kills me), random electrical stuff, beam removals and installation of a header, and then the hardwood on our FOUR sets of stairs. We loved the two guys who did our last set of floors in our old house, so we hired them to do the hardwood floors and tile again. 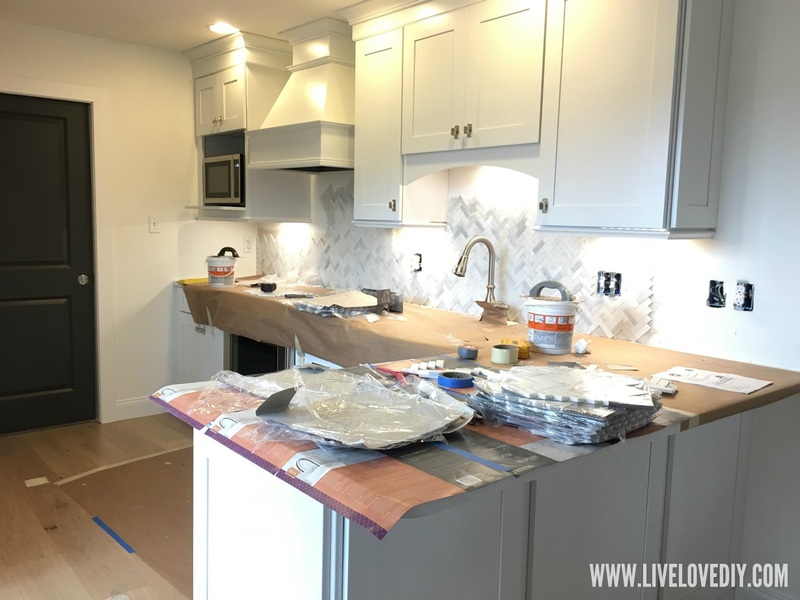 Our house was completely gutted within a couple weeks and the projects were completed within about 6 weeks, so everything happened really quick and our house felt like a beehive with people darting around everywhere. We moved in with my mom while all this was happening. Thank the Lord. I don't think I could have lived in the house during all of that with Ava. You would surely be hearing about my stay in a mental institution by now. Also, I decided to save money by redoing all of the bathrooms on my own, painting every square inch of the house, and having Jesse install all the light fixtures. So, I handled all of that after the contractors were done and we were moved back in. And if you've been following me on Instagram, that's what you were witnessing....5 brutal months of me doing manual labor. Not the best decision I've ever made. Anyway, so back to the kitchen makeover. We met with a kitchen designer at Lowe's. She came out and measured and we discussed my ideas. It was really brief and to the point, mostly because when she arrived, I was prepared with a very terrible drawing I had made. I genuinely wish I would have taken a picture of it. It did delight. A couple weeks later she emailed a few design renderings, showing what the kitchen would look like in various designs. And then we just went back and forth for about a week, as I narrowed down what I wanted. I think I went to the store once. I was pretty set on what I wanted, and also the kitchen designer just did a really great job of interpreting what I asked for. Some of what I wanted was not sold at Lowe's, so I sourced that elsewhere on my own and had our contractors install it. Here are a few of the different design renderings I got before we started the kitchen makeover. 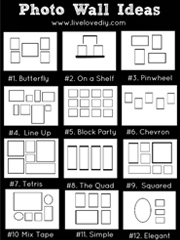 I loved having these to look at, as it put my vision on paper and helped me narrow things down. One of the things I was really going back and forth on was taking out the existing peninsula and creating a galley kitchen instead. I thought it would really open up the kitchen. And then I saw the reality of it and was like, I will have three tiny chunks of countertop space. Nope. The other thing I was interested in was replacing the upper cabinets with shelves. Again, I saw the pic, and was like, nope. 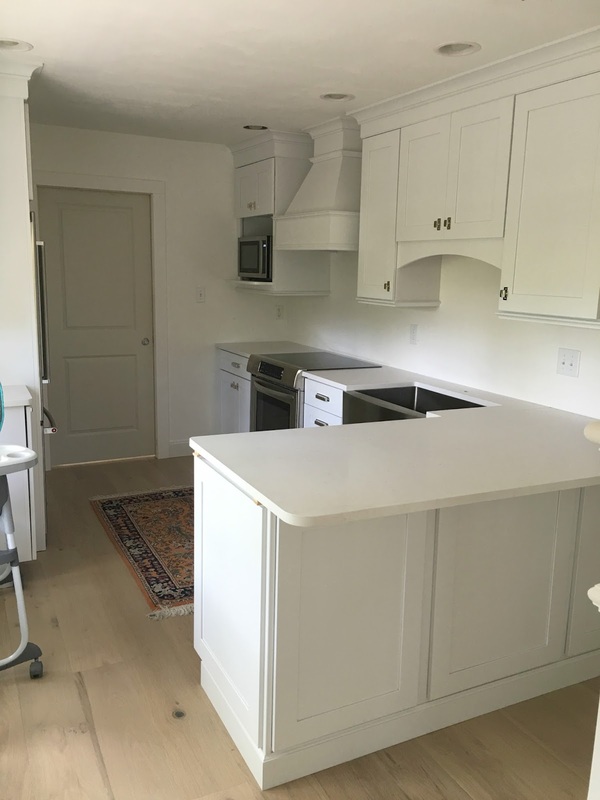 I still love open shelving, but I really wanted the oven and hood centered on that wall, and it just couldn't be done because of all the stuff we had to fit. Plus, I really thought about what open shelving would be like for my little brain to live with, and the answer is torture. I get stressed by a bookshelf. I'm kinda minimalistic, purely for my own self preservation, so I don't think I would have fared well. I imagine that I would have three bowls, one on each shelf, and be like, now what?!? This was the side view of both galley style options. I was just curious. That's why these renderings are amazing. It really gives you a good sense of what you would be getting. I had envisioned this really open kitchen, and instead it just felt like I would be standing around all the time with no counter space. So, we decided to keep the peninsula, but to make it smaller, and to rearrange some appliances, etc. Here is the final design we chose for our kitchen makeover. 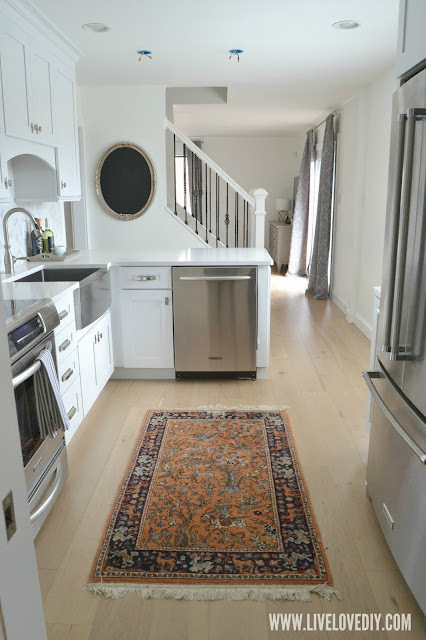 For reference, the things I told the designer that I wanted for the kitchen were white shaker cabinets (all the way up to the ceiling with crown moulding at the top), marble or quartz countertops, a custom hood, a counter depth fridge, and a stainless steel apron front sink. 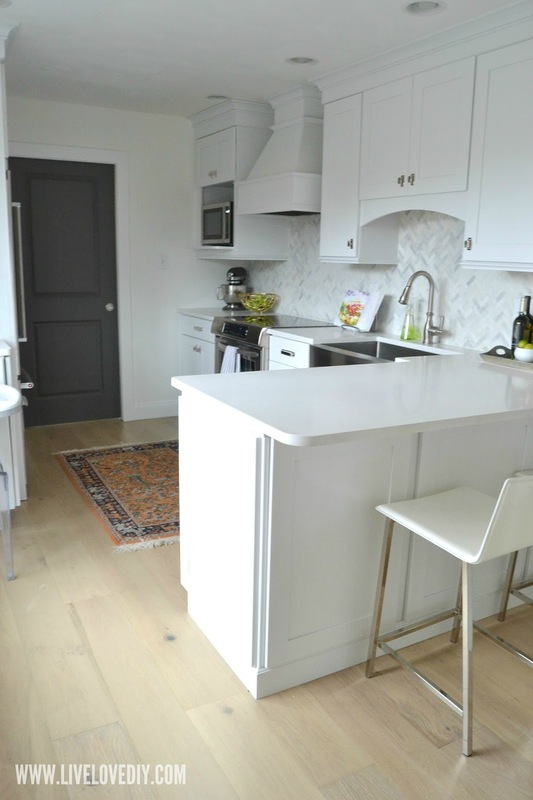 As for the changes to the peninsula....the existing one had the sink installed on an angle and it drove me crazy. It took up counter and floor space and just seemed awkward. So, we moved the sink, moved the dishwasher, and made the peninsula smaller so that you have more room when you walk in the kitchen. Here's the rendering that shows the kitchen from the other side. The house came with a fairly new oven and dishwasher, so we kept those and then I bought the matching refrigerator, in a counter depth version, which I am SO pleased with. I'm never going back to the big clunky version. 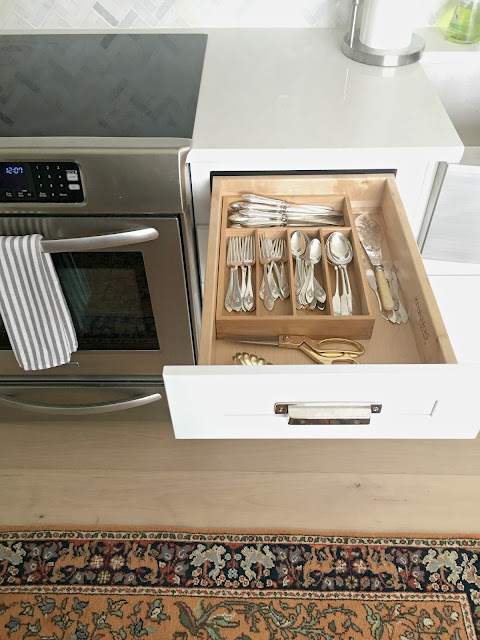 It's a really nice space saver, especially in a smaller kitchen, and now that we are using it, I can't even tell the difference on the inside. Once we decided on a design, it was time to gut the kitchen. Here was Jesse's contribution to the kitchen makeover. The rest was done by a very nice subcontractor who Jesse said looked like muscular Joey from Friends. I never really saw the resemblance, but it entertained me to no end. 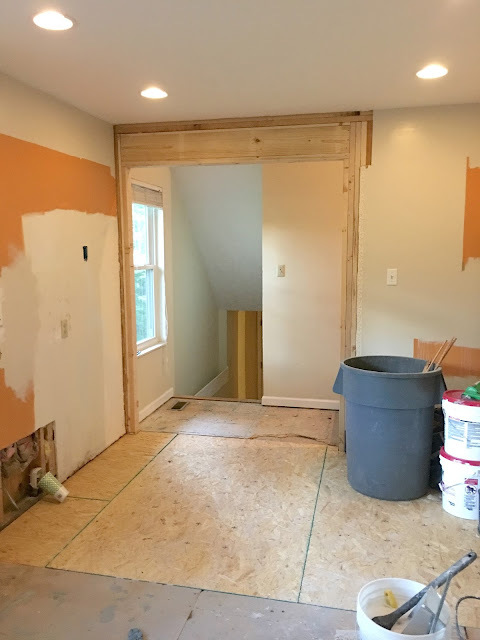 The doorway to the hallway was gutted so that a pocket door could be installed, which I'm so glad I decided to have done. It lets us close off Ava's 'wing' (as I refer to it....her bedroom, her bathroom, and another bedroom are all over there). It's so nice when we have people over or during her naptime. I know it's a funky layout. That's probably why this house sat on the market for 4 years before we bought it. Well, that and the Tuscan eighties vibe. But, if I wanted to live in this part of town, in this very particular area, I had to be willing to get creative. That's life. You make the best of it. Here's the pic of the pocket door getting framed back in. Around this same time, we had to replace all of the subfloors throughout the main level. Once we ripped up the existing flooring, the particle board was in really bad shape and even rotting in some areas, and I've already made the mistake of not replacing particle board subfloors once, so replacing it was a must. Here's a pic of Ava and Jesse stopping by the house to check on the progress. We were living at my mom's house nearby, and we tried to stop by every other evening or so. We were so excited to watch things change. 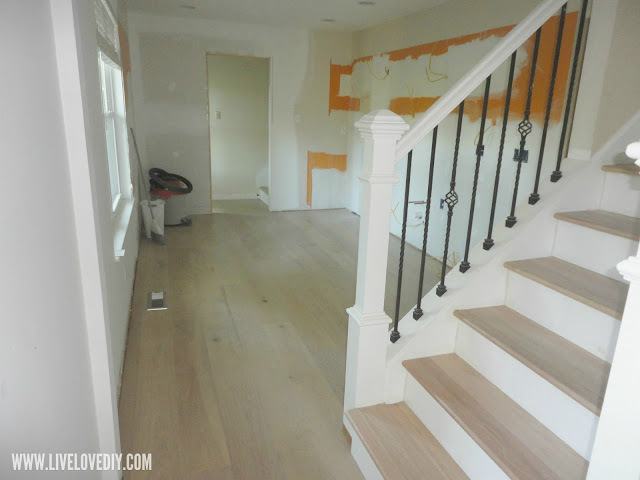 After the kitchen was gutted and the subfloors were done, the hardwood flooring went in. 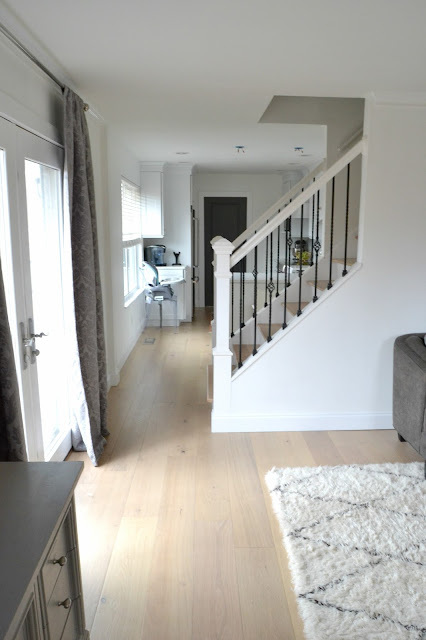 I'll do a separate post on the floors, but for now, if you're curious, we used Provence Manor European White Oak in River Rock (in a 7.5 inch width plank). We found them at Heartland Hardwood Flooring here in Knoxville (the same place our last floors came from). I spent so much time and energy choosing the flooring, and I really love how they turned out. Can't express that enough. Ava helped me pick them out. This is the tile that was there, and it was just so not for me. After a few weeks, the flooring was done and the cabinets were installed. I was just so nervous about everything and I didn't trust myself one bit up until this moment. It still had a long way to go at this point, but once I saw this, I knew it was gonna be what I had envisioned from day one. And the little fridge hole, as I like to call it. They hadn't put the crown moulding on yet, up around the top of the cabinets, which freaked me out at first, like who missed my memo?! But, it happened days later. Apparently, a kitchen makeover doesn't happen in a day. I knew that I was going to be in charge of painting every inch of this house by myself after the contractors finished their part. And it was around this moment that I started wanting to slap myself for not painting the orange wall before the cabinets were installed. We ended up having to wait a couple months for a backsplash, and I was throwing a big Christmas Party, so I definitely got to spend an entire evening squatting on the countertop with a paintbrush. I mean, it would have taken 10 minutes to roll that entire wall. Here's a pic of when the fridge finally arrived and I got to banish the mini fridge to the garage, a real celebratory moment. Ava's mattress is in the doorway, I don't know why. The sink also got put in. There were no countertops, or water, but I kinda just hovered over it for awhile. The next step was choosing countertops. I wanted marble, I wanted it so bad. Ava and I went to a bunch of different stone places around town and drooled over marble slabs. Honed Calacutta was what I was lusting over. I had the fever. I lived with marble in our last kitchen (below), so I knew what I was up against. It was crappy pink marble and cut into tile, but it was marble, nonetheless. It would etch and stain every time I set a cup of water on it, and I was such a crazy person (with way too much time on my hands, back then) that I literally used to buff the etches out every so often with an orbital sander and a automobile buffer pad. What was wrong with me.
. And yet, somehow, I was certain I could do it again. But, like, with brand new fancy marble. Ultimately, I agonized over the decision long enough that I realized that I wasn't listening to myself. I could pretty much envision myself rocking back and forth in a corner crying 'patina'. I want to be able to allow my guests to drink red wine without following them around. I want to be able to pour salsa on my countertops and just roll in it, if the mood strikes. I want to be able to cook with Ava and have her leave dirty handprints everywhere. I don't want to constantly stress out over anything in my house. And btw, I know a lot of people say you can seal it and it's fine, but I just had to trust my little anxiety-ridden gut on this one. I am not a person meant for marble. So, I went with Quartz countertops. And I've never looked back. I love it. 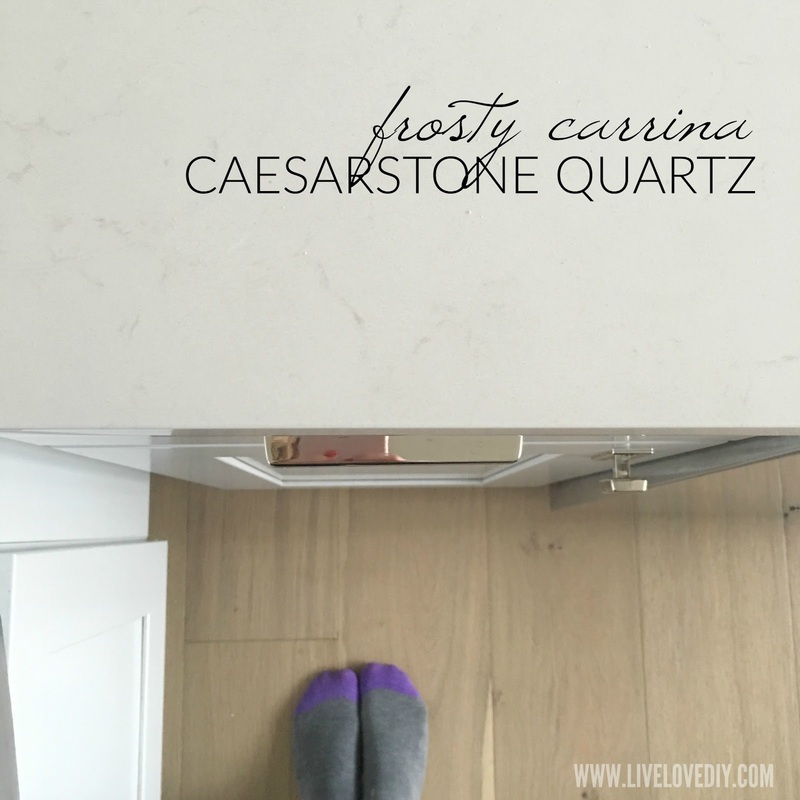 I couldn't find any quartz I liked at Lowes, so I went to a specialty stone place and ordered Caesarstone Quartz countertops in Frosty Carrina. I am summarizing quickly so as not to create a 45 page post, but I did so much research and looked at so many different countertops, and this was the one that spoke to me. I loved that the veining was so subtle in this one. 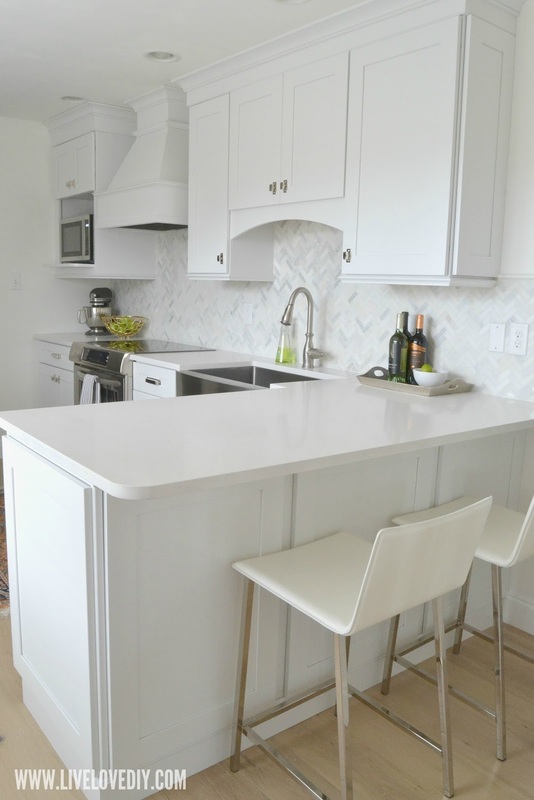 And the main reason I decided to get quartz countertops is because they are super durable and will stay looking brand new with very little maintenance. And that has proven to be true. I basically just wipe them down every so often with water. Or some Method countertop cleaner. And if you do leave anything on it overnight and it happens to stain, you can fix it. This has only happened once, I think it was kid's cough syrup, and it came right up with Softscrub with bleach. I found that solution on Caesarstone's actual website, and lo and behold, it was legit. So, the quartz countertops are amazing, but the actual installation of the countertops was a total headache. Solely because we had a bad contractor that was sent to us by Lowe's. You can buy Caesarstone through Lowe's, but you have to go through a specialty stone store that they will refer you to. The contractors installed them wrong and had to come back several times to fix it. At one point the countertop was installed with about a 2 inch gap between the countertop and the wall. Like, um, what goes there, guys? Turbo caulk? And they had written letters on the different parts of the countertop in ink (I guess to help with install, I dunno.) that we couldn't get off. And then, as a special cherry on top, they scratched up the sink AND the dishwasher during the install. 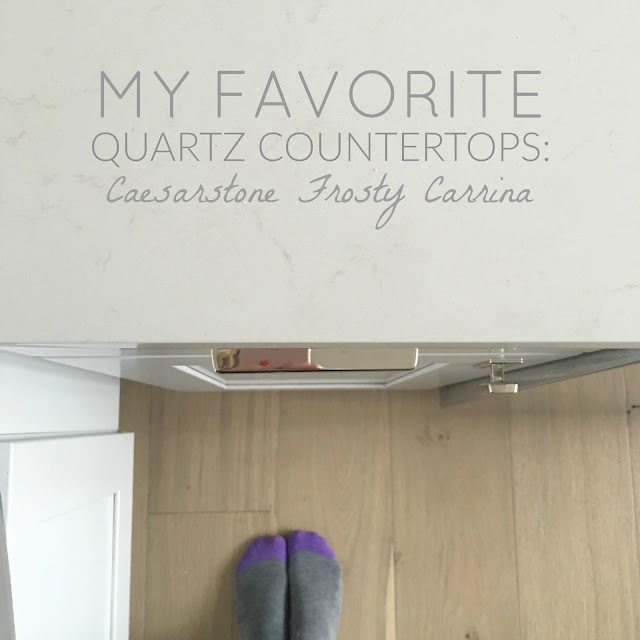 Oh, and I specified a squared countertop edge on the quartz countertops, and they send slabs with rounded edges, and I ended up just caving on that one. Because they kept sending back the SAME guys to fix the damage, three separate times, and it was enough to give me a heart attack. In the end, everything was installed correctly. The ink was removed. The scratches on the sink and dishwasher were able to be buffed out. And Lowe's gave us a partial store credit. So, it worked out. But, it was a total headache. And that's just honesty. 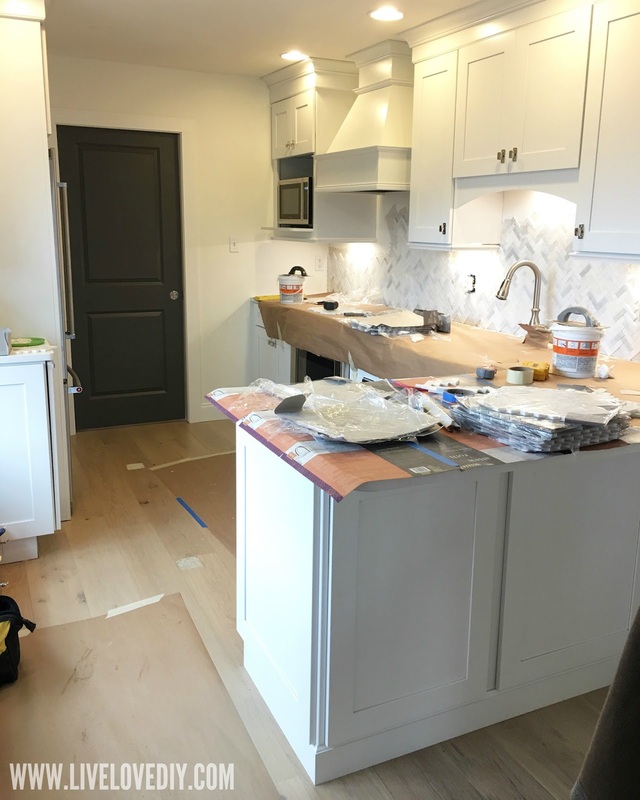 The below pic was towards the end of the install, where they said it was done, and we later discovered that they left wood shims underneath the countertop. So, that obviously resulted in an additional visit. Can I just reiterate the word 'hassle'? Anyway, I tried to keep some perspective. Like, Virginia, you are installing a brand new kitchen. Get over it. Here's a pic of when I started to paint the new pocket door. I had new doors installed throughout the house. I chose the 2 Panel Carrara. Not sure where these were from, as we ordered them through the contractor. But, I love them. I painted all of the doors in the house black (specifically Sherwin Williams Urbane Bronze). 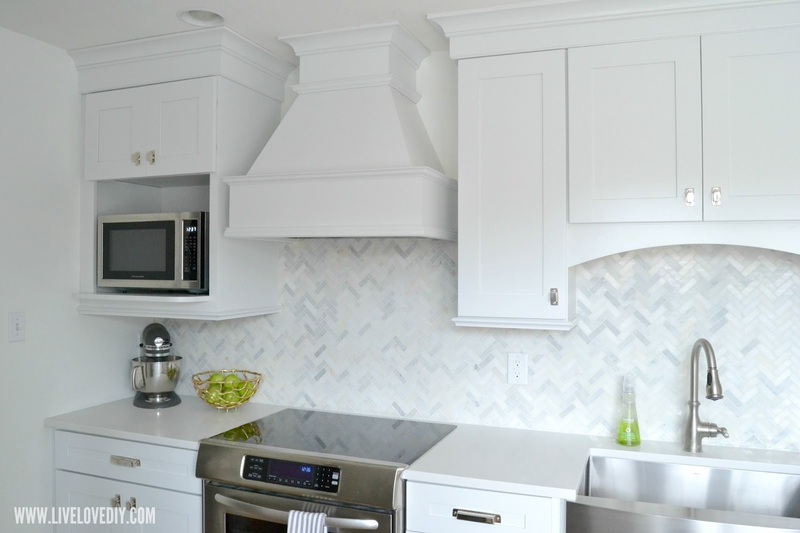 The backsplash I had my heart set on was this marble herringbone from the Tile Shop. I loved the look, but from what I remember it was about $20 a square foot. So, no. And then when we got that Lowe's store credit, I just happened to find something comparable there, for much less. So, back to Lowe's I went to trust them with subbing out another installer. This was months after our GC was done, and we had that store credit to use towards the installation, so I crossed my fingers and went for it. And fortunately, the contractors they sent us this time did an impeccable job. They were in and out in a day, and it was meticulously done. So, you just never know what you're going to get. These guys were super professional from the moment they knocked on our door though, so I had a good feeling. The other guys (the quartz countertop guys), I truly had a weird feeling from the moment they started. Trust yo gut. This was during the install. 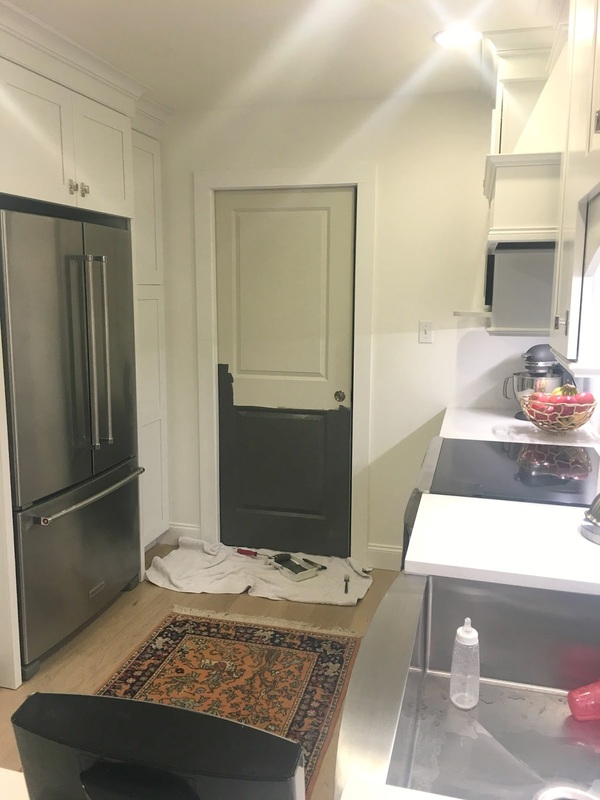 So, here are some of the finished pictures after the kitchen makeover, the best I could get with my poor photography skills, but you'll at least get the idea. It's a space I truly adore. I spend half my life in here, I swear. I don't know that I've ever been happier about a room in my house. In the words of Shania, Man, I feel like a woman! I really hate having to get all of the real stuff out and attempt to get those really nice pictures (at least once!) and sometimes I notice something I forgot, like a backpack or an ipad, and just say, screw it, and then it just all goes downhill and I start using my iphone for photos or end up taking random candids at night to show you what it really looks like. Pretty sure all of these things will happen here. I am not meant to have perfectly styled photos. I resist it with every fiber of my being. I mean, are we pretending like I could do it if I really wanted to? Maybe I should become a swim instructor. I haven't figured my life out yet. Here are a few pics before and after the kitchen makeover, taken from the same angle. That little chalkboard is a thrift store mirror I painted. I haven't installed any pendant lights over the peninsula yet. I haven't found what I'm looking for there yet, and I've been looking for a long time, and part of me just wants to drywall over the holes. I'm still pondering. The chairs I got from CB2. They are white leather with chrome legs, and I really, really love them because they don't take up much space and are pretty comfortable. 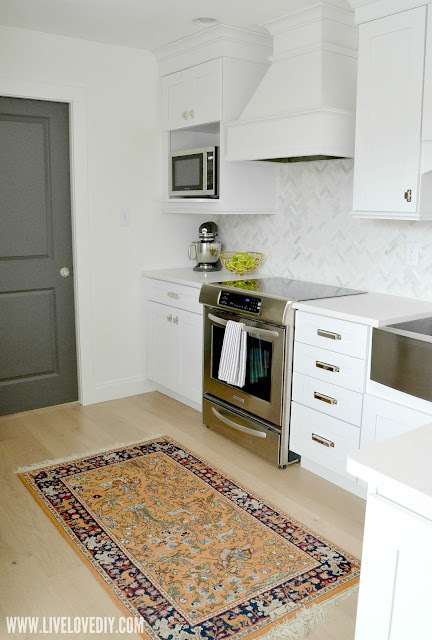 The rug is my favorite thing in the kitchen. It was in my grandmother's house for decades and she gave it to me a few years back. I've been hoarding it for years, never having the right spot for it. And as the kitchen started to come together, I started looking online for little antique rugs, and I realized I had this one rolled up in the garage. It was a real lightbulb moment. I'll never ever move it. I'm also really in love with the custom hood. It was one of my few splurges during the kitchen makeover, and worth every penny. Not having to get any appliances (except the fridge and microwave) really helped me with the budget. The faucet was also provided to us by Moen. 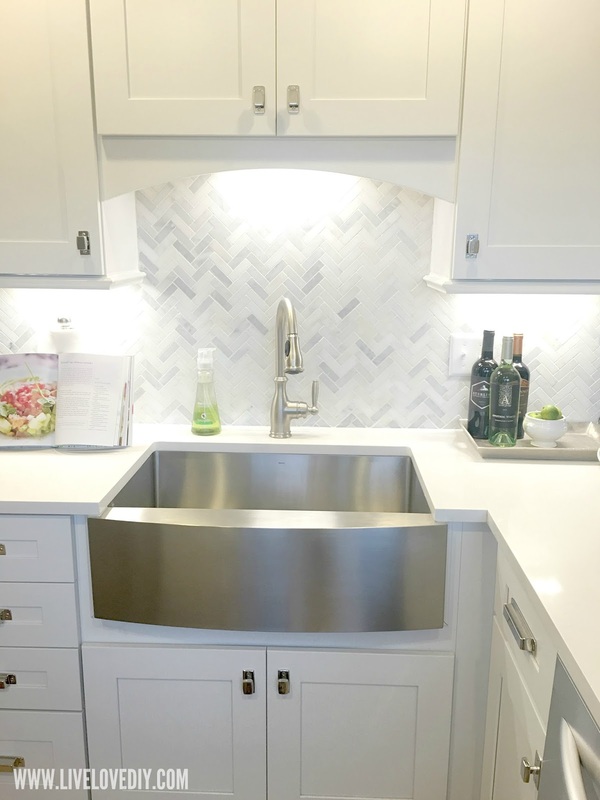 It's the Brantford spot resist stainless steel faucet and it has a little pull down handle, which I absolutely love. And obviously that sink. The freaking sink. For specifics, it's the Moen 1800 series stainless steel single bowl sink. I love the way the kitchen looks at night, too, with the lights on. We installed undermount lighting under all the cabinets, and it's just so warm and inviting. My grandmother also gave me some of her china and silver when we got married, and I never used it, thinking I would ruin it. When we moved here, and started unpacking, I decided to unpack the little beauties and use them. I'm sure I will end up ruining them, but I'm never going to have any formal dinners or fancy parties where people use silver, so what am I waiting for? I put my gold Target scissors in there, too, because they deserve it. Here's a good before and after comparison. I obviously couldn't be bothered to take down the baby gate. So, that's the kitchen makeover. Omg I did it and it turned out okay. To all of you who have interacted with me for months over on Instagram, thank you for sticking with me while I wasn't writing blog posts, thanks for cheering me on, and thanks for being so excited about me coming back. It really means the world to me, and it was just what I needed during a time when I was my most insecure and anxious. There's not enough Lexapro in the world to substitute for the mental boost you guys constantly gave me during the renovation. For those of you who don't follow me on Instagram (where I've already shared these and SO many more....like, tone it down, Virg. ), here are a few snapshots of us living in the kitchen over the past few months. I strapped Ava's booster seat to the lucite chair. It does delight the mama. This was about 10 minutes before our huge Christmas party we threw at the house. It was truly awesome and made me feel so happy. My bestie, Marg, was staying with us that weekend from out of town, and she gave Ava her old Christmas overalls that she found at her mom's house. They were too small, and Ava kept blowing the crotch snaps out. It was a real hit. I mean, just a girl in a tutu spaghetti strap dress in the dead of winter. You make it work, friends. I think that was Christmas Eve. Jesse was making some Ohio peanut butter balls. Buckeyes, maybe? He made them way too big, and he made way too many, and we ate them for a month. Who's complaining. I was wining and coloring, and Ava was Scooby-Dooing and snacking. We're pretty happy here in the new house. My life is always kinda messy. I have a strong personality, and I'm kinda always flinging about and trying to find my way. I'm feeling softer lately, like things make more sense. I can just be myself. I don't know if it's the house, the toddler, or a combination of the both. Or maybe the fact that I've persevered through both. Thank you guys for being here. I'm so happy to get to share with you again. And I don't take it for granted for a second. It's truly a blessing to get to do what I do, even if I have to take a break once in awhile. I'm thinking my next post will be about the living room and the dining room, perhaps the pics from the renovation when the flooring was going in, etc. There's a lot to talk about in this area. So, I think I'm headed there next. I'm hoping to kinda work through all the areas in the house that are completed, bit by bit, and then later on, we can move on to all the stuff that is not done. I mean, like I painted 2 of my 3 bathroom floors. I got to the end of the reno budget we had set aside for this house, and was like, welp, I'll just start painting everything in sight that can't be gutted, and we'll circle back around later. And as a result, I accidentally created some fun (probably temporary) solutions that I actually kinda love. From limitations comes creativity, my friends. I feel like I just accidentally Luanne De Lessep-ed that line. It feels like one of those times that you get to see a long distance friend and you just talk for hours to catch up on everything. Your kitchen is beautiful. I love that there are many details, but it comes across so simple and pretty. You have such talent (and patience)! Love love love! It looks so good - you did an amazing job! So happy to have you back, the kitchen is absolutely perfect! Love it!!!! I love the painted doors - I totally want to do that now!!! Gaaaahhhhh I can't really paint until summer hits CA because rain. And dampness. Thanks for the grand ideas, as always!!! Love it -- absolutely love it. Just take a breath, and a bow, because you're back in the groove. You did so well! Thanks for sharing and thanks for the inspiration. It looks amazing! So, so good. I'm so glad we get to hear all the details. We are midway through a house/kitchen reno and I can so deeply identify with everything you've said about living with a half-done house. So it is super encouraging to see your before and afters - it gives me hope that I will get through! And oh, so love your choices for flooring and cabinets and colours - it just feels like a breath of fresh air. It is a long one but I loved every second and line while I read it. The kitchen looks amazing and I am happy that you sound happy with the results after all the stress. I follow you in Instagram so I already saw some pics, but now seeing the pics with all the story is like I am living it, Congrats for you new home!!! It turned out stunning. You have great taste lady! I feel you on the insecurities of Reno-ing.. I second guess every home related purchase I make so I look forward to/dread one day doing a new kitchen in our "forever" home. Keep rocking!! It is a long one, but I loved every line, your kitchen looks amazing, I am happy that you are happy with the result, and the important thing is that you did it just as you dreamed, it is true the kitchen is the place where we are a big part of the day and families love to get together in the kitchen, so, you will create a lot of happy memories there. I follow you in instagram, so I already saw some pics but with all the story is like living it. Congrats for your new home amd welcome back to the blogging world. I feel your construction pain.......just finishing master bath Reno! Your kitchen turned out beautiful! Welcome back! !I am excited to see the upcoming projects. You are an inspiration! It was worth the wait. Your kitchen turned out amazing. 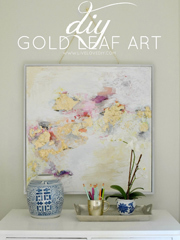 Love your decorating style - excited you're back! It looks so beautiful and light! That orange wood had to go, and painting it a light color really makes it look so much bigger! I love your new kitchen. One day, when I'm actually a grown up (is that ever going to happen? 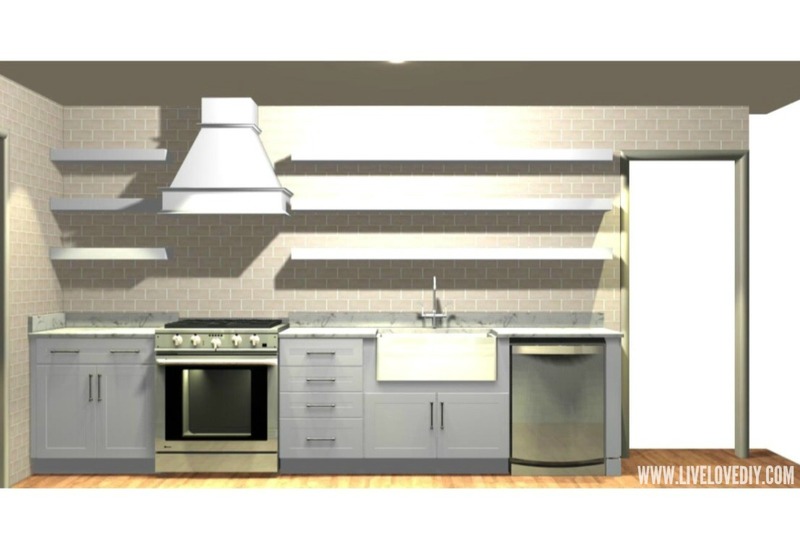 ), I won't be renting an apartment and I'll get to make over a dream kitchen. My mom has granite countertops and loves them. She said never to do marble because it's so fussy. It's beautiful, but porous and easily damaged, as you stated. Love the quartz! might not put pennant lights in the kitchen. Open space looks good to me and is so calming. Ahhhhmazing. You're the best. You have no idea how many times I'm at the hardware store (Ace) and I panic on what the heck I'm doing, only to quickly pull up your blog to guide me...running away from the workers asking me if I need help until I find what im looking for. Keep doing you girl, or don't, whatever, we all love you and think you're great. I'm so happy you're back!! The kitchen looks AMAZING! You did a great job, keep doing exactly what you're doing screw being a swim instructor you don't want green hair anyways. I actually laughed out loud a few times. Especially the Ohio peanut butter ball line, being from Ohio I knew exactly what you meant. The kitchen is beautiful. You go girl! You made some absolutely fabulous decisions, and I know it was a pain to get through, but it all makes it worth it now right?! I'm so glad you went with the cupboards instead of the shelves, that would have driven me absolutely bonkers! All your choices, but specifically the tiles, quartz, door paint and floor boards were on point. My kitchen is an 80s/90s retirees nightmare, but you sure can make a girl dream! I love your work, keep it up (when you can!). Congrats! The kitchen looks great but guess what looks ever better - you and your happy family!!!! So glad to see you're settling in nicely and enjoying life. And, as an Ohio-raised girl, there's no such thing as a Buckeye too big or too many!!!! Loved reading this, it gives me hope. Good to see you back here, love looking at all the photos. I've been following you on instagram too! 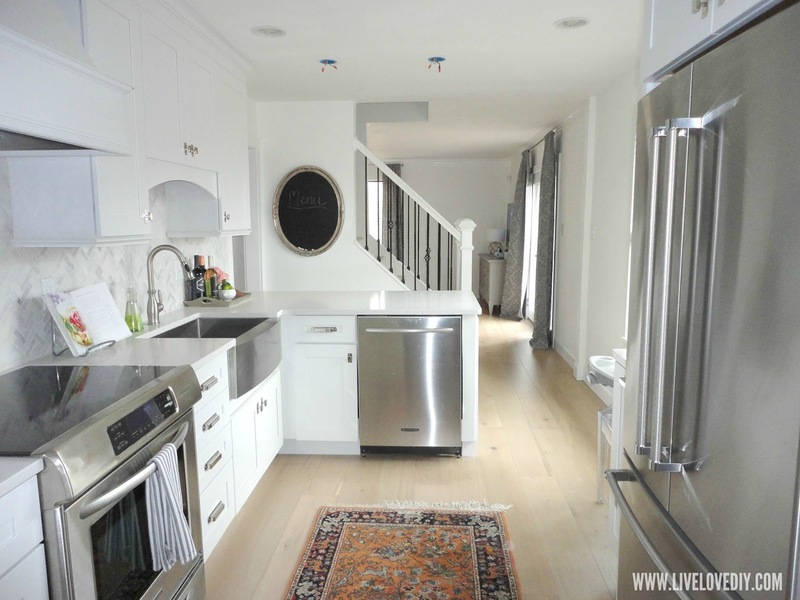 The kitchen transformation is amazing! It feels happy and calm and perfect for your family! I love it! I wish I jar gone with quartz for my kitchen countertops (went with black granite and turns out it's like having a mirror countertop...I am constantly polishing the thing so it looks good). And I love the rug, second only to that smiling girl that is the jewel on the top of your crown. Your new kitchen is absolutely stunning! I've only recently found your blog. Reading your posts while you were taking a break and anticipating your newest post! Love following you on IG. Can't wait to read your next post. :) Happy Friday! Congrats! It looks amazing. When we moved in, our kitchen had an "ode to all things ivy" theme. Wallpaper, curtains, dish towels, even the fricken trash can had ivy on it! So taking out the ivy crap, removing thew all paper, and painting made it look so good immediately. 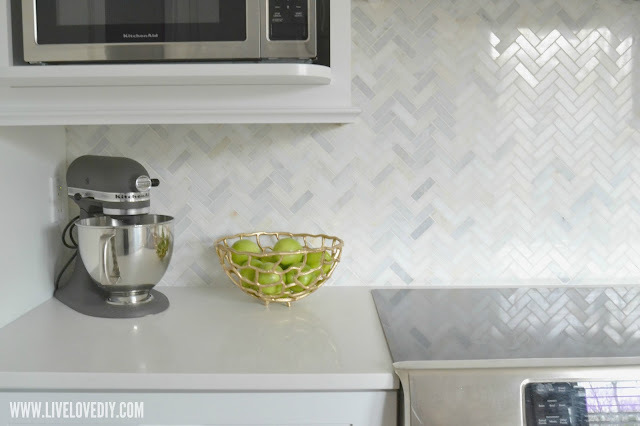 Eventually I'd love to do a new back splash and such, but for now it's just not a priority. Love it all. I always look forward to your instagram posts and I'm so glad to see a new blog post! 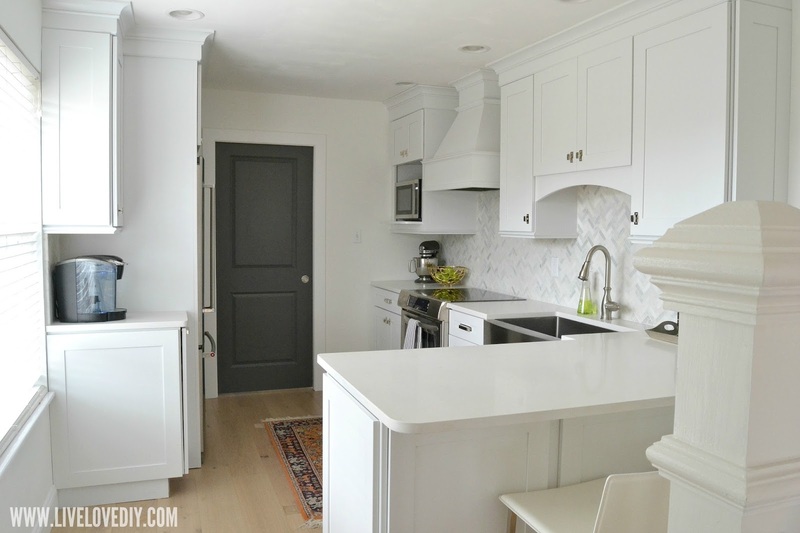 You're reigniting my kitchen reno itch! I'd love to take a sledgehammer to our kitchen but apparently tearing out your kitchen when you're still a year away from affording the renovation is a bad idea. Sigh. It is truly a beautiful space! So happy that you're back at writing the blog. I follow you on insta, which is great in itself, but your blog is what gives me confidence that I can also diy! And don't you fret, you better believe it was still getting used while you were taking time for yourself - how else would I know how to make chalk paint?! (you'd think I'd have it memorized by now). 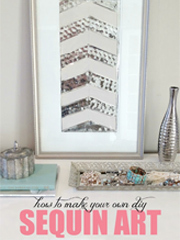 You make blogging look easy and your house is going to be even more beautiful than your last. Welcome back! This is my all time favorite blog, and I'm so happy your posting again! I've been following and liking you on Instagram but I get anxiety at the thought of commenting. (Even now I'm super anxious that this comment will waste your time.) 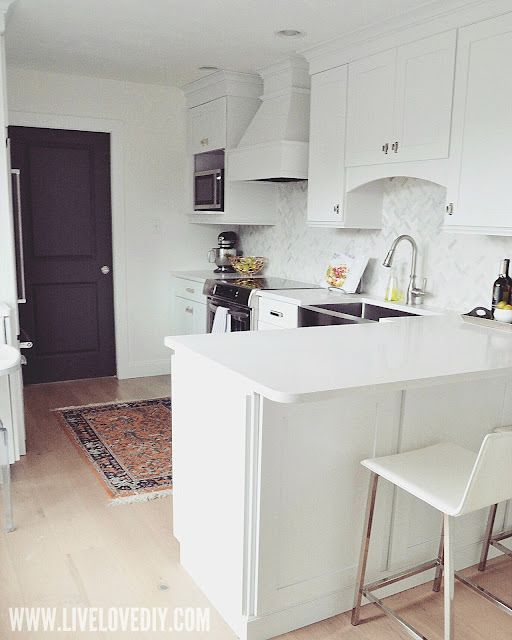 I love the kitchen, it's so beautiful and clean and serene. I can't wait to see what else you're doing with the rest of your house! Welcome back to blogland, and don't worry, if you need another break your readers will be patient! Thanks for sharing all those photos! It looks great. Not only are you my favorite blogger of all the bloggers in the blogosphere because you have good taste, but you're hilarious. I'm so glad you wrote a new post! The renovations and painting look SO GOOD. We are basically having to paint every square inch of our house (including trim and doors), and have been for over a year, so I feel your DIY pain. Love it! 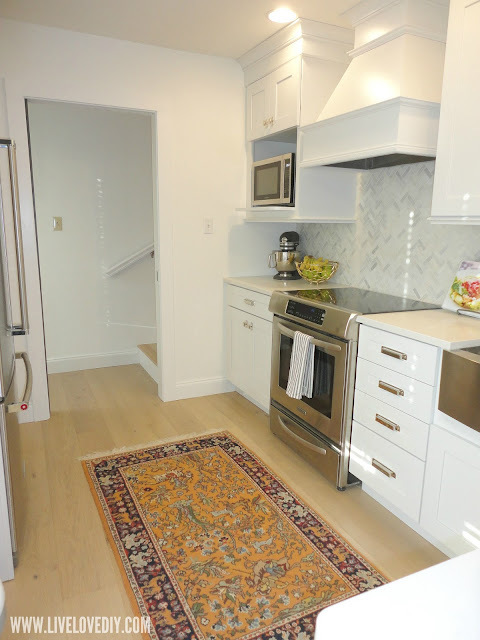 The kitchen came out amazing - the countertop and floors really look great together!! Looks very nice. Funny, we remodeled our home about 2 yrs ago and I have the same backsplash and cabinet pulls. We used gray grout though. Love the painted door. breaks up all that white. 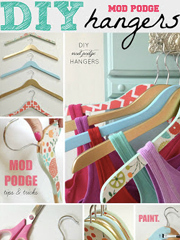 You were one of the very first DIY bloggers I followed and it is SO good to have you back! Really, you're an inspiration to all of us DIY bloggers out there :) Thanks for doing what you do, the kitchen looks incredible!! you have created for your family! You did an ecellent job!! I feel like such a creeper because I've never commented, but I've been stalking your blog and IG for years. Awesome job with the new kitchen, looks AMAZING! My husband and I are in the throes of a kitchen/triple bath/basement remodel (OMG I KNOW). We are doing pretty much all ourselves except for the obvious plumbing/electrical stuff that we are definitely not qualified to tackle (ugh, what were we thinking?! ), because money. Not that we’re that qualified to tackle the other stuff, let’s be real. Full gut on everything mentioned above, going on since the beginning of September. If you saw the before pics you would die, they are so bad. We are living with my in-laws, doing small snippets of work after our toddler goes to sleep (she's only like a week older than Ava! June 17) and going to work full time during the day. It’s a miracle we haven’t killed each other, hahahahhaa. I laugh because if I cried I’d never stop. ;) It’s unbelievably hard trying to pick out everything, second guessing all your choices because then you have to live with them if you end up not liking something. Not FOREVER but like…for a good while because it’s going to be a while before I can afford or want to tackle anything like this again. Now that you’ve read through my incredibly long and unnecessary preamble (maybe not), could you tell me how you ended the kitchen backsplash by the peninsula? Did you finish with some bullnose tile? 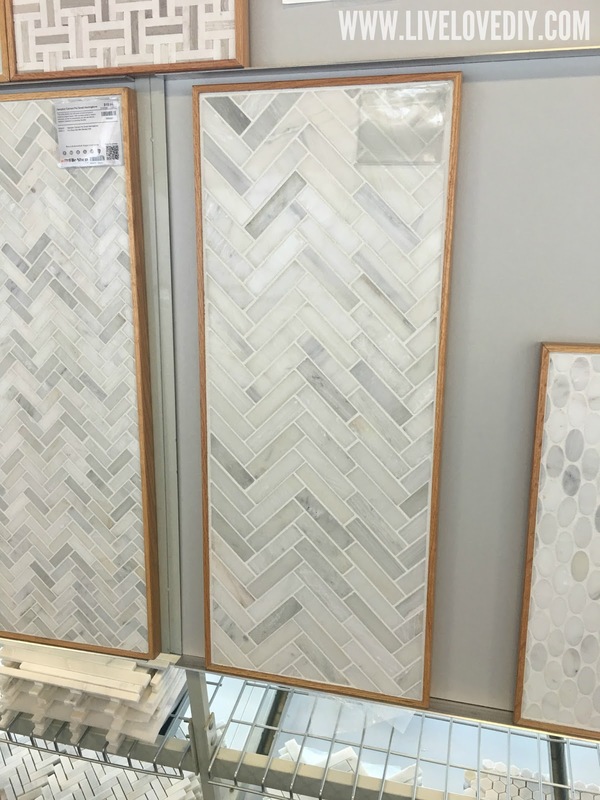 How far away from the cabinets did you take the tile? Did it just go to the edge of the counter? That’s the one angle I wasn’t able to see. :) Also, question about the undermount lighting since we’re wanting to do that as well: what kind did you get/where? Halogen, LED, etc? Is it hardwired? We had our electrician run some wiring for that but now I’m like paralyzed with fear that it was a waste and we didn’t need it, even though it’s not a big deal and could literally just poke the wires back through the wall and forget about it. But we PAID for it so OBVIOUSLY something needs to be done with it, right? This is the stuff that goes through my mind, smh. Thanks in advance if you ever reply to this insane comment, but I won’t blame you if you don’t! Hi Jen! UGH, I love nothing more than a really long essay comment. I totally live for them. So, first, thank you for giving me something fun to do. Second, to answer your questions...the tile by the peninsula. I wish I could insert a picture here. We used bullnose tile (just the marble bullnose from lowes) and the backsplash and bullnose go all the way to the end of the wall where it meets the trim. 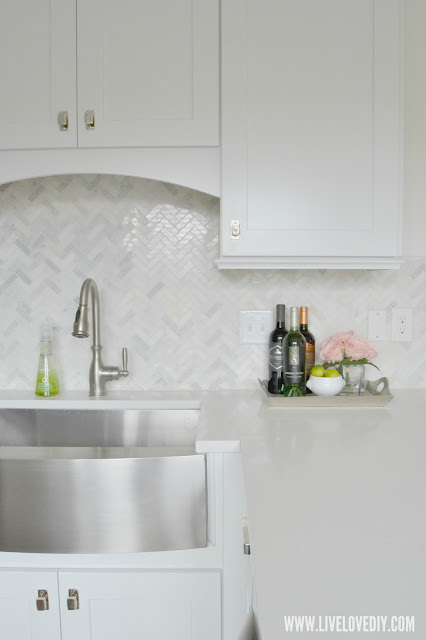 And the countertop pretty much goes to the wall, too. The undermount lighting is LED, hardwired, also from lowes. I promise it won't be a waste. I love love love just having the undermount lights on. I use them all the time. Love this update! Have been following you on insta and cheering for you. It came out amazing! We bought a house last January and spent 9 MONTHS last year DIYing most of the full-gut. While living with my parents (& our 2 kids and dog. YIKES). So deeply related to so many of your posts! Looks fabulous!! I just installed new wood tile in our home but couldn't go a light as I wished (like yours) due to the other flooring we weren't replacing. It looks so bright! So how do you do dishes and load the dishwasher? It looks tight! Just a question as I'm looking at our kitchen and debating if I can handle some renovations! I'm so glad you're back! You're blog is my favorite. The kitchen is gorgeous. Can't wait to see more of the new house. I've been anticipating this post like a kid does Christmas! I love reading your blog and more recently following you on instagram. Your kitchen looks absolutely beautiful and I'm in love with the herring bone tile you picked. Also, I've lived with orange kitchen cabinets for YEARS and wanted to paint them for soooo long but haven't had the guts. With your tutorials, at some point, I just might. I'm installing instagram as we speak, so I can follow you. I've missed your blog. I love your kitchen. I love your new kitchen! I have a white kitchen for 18 years and still love it. The white is everlasting. Tell me about your kitchen sink please, I've never cared for a stainless sink because of spotting, so how is yours holding up? First let me say that it is good to have you back. I have missed your inspiring ideas. You are truly creative. Second, what were you thinking not listing the paint color of your cabinets since they go so well with all the other items in your kitchen and I am guessing other inquiring minds want to know. ;) Please forgive me if you did print it and I just missed it. Old eyes you know. That sink is just spectacular and I love the counter depth refrigerator. Job well done. SO glad to see your posts again. (Yeah, I was having sad thoughts like...what happened to her? ) 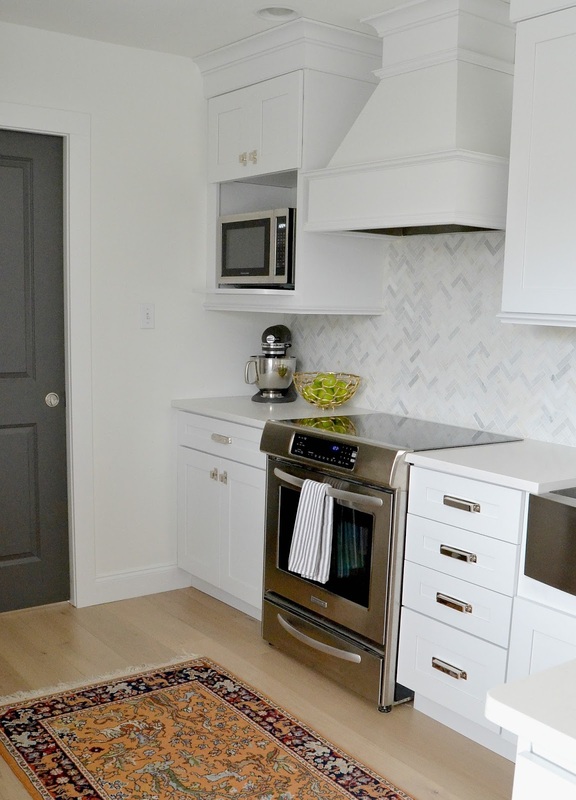 Love your kitchen redo. My kind of place...if I was to re-do a kitchen from scratch. So glad you're back! It was definitely worth the wait! Ok now this is spooky, just got your email round (in England feeding the baby in the night so odd times and that) and I had just been saying to my mum earlier today (OK yesterday now) how I miss your posts and hope you're ok and doing well with your new house ... And there you are in my inbox! It tough enough learning to parent but then I also know how tough it is moving with a toddler into a house that needs work, we relocated and moved two homes into a new multigenerational one 2 weeks after my daughter's first birthday. We've since lost my grandmother but been blessed with a second girl and I feel like my feet haven't touched the ground since we made the decision to move so don't feel bad about the blog! The kitchen looks great, we went with white Quartz too and it made a huge difference to bringing quality of light to our dark kitchen. Just wish we'd found the extra cash to redo the lighting in there, the previous owners tiny spotlights are rubbish, we basically live by our counter lighting, but I like the atmosphere it creates! You definitely had a vision! I agonized along with you while reading this but thought your descriptions were totally hysterical and very entertaining. I wish we were neighbors! Hi! I started following you when I ran across your Christmas tree skirt on Pinterest a few years ago. You're my favorite decorating/DIY blogger and I had been wondering where you'd gotten to. In fact I'd just thought about you last night and hoped everything was well in your neck of the woods. So glad to have you back! And the kitchen is gorgeous! Glad you didn't go with the gtey trend that is so in vogue now. Oh, and Ava is beautiful and has grown so much. She has an adorable smile. I've been following your blog and Instagram for just a bit. I feel like I know you and am so proud and excited for you! You did great! Love, love, love your choices and that you are so honest about your own shortcomings. By the way, I bought a little thrift store piece and painted it following your advice, and I LOVE it! I'd never done anything like that before, so thanks for the inspiration. Hang in there, lady. You done good! Just love your backsplash...what an amazing transformation...and the mirror & chalkboard, just genius! Hope we can soon see more posts :) Really love your blog...Have a great weekend with your family! Wow it turned out beautiful! Love the sink and backsplash. You give me encouragement when I see what you do. My husband and I are undergoing a major renovation on our home this year - new roof, siding, windows on the exterior and inside a kitchen flip, flooring (which only half the house has right now), mouldings, etc.) Just hope it turns out half as good as your did. PS: glad to see you back posting! I also really, really, REALLY wanted Carrara tops, and they told me they could be sealed and that their sealant was excellent, and I so badly wanted it to be true. But then the kind guy from the stone place gave me a sealed chunk so experiment with, and I put a teabag on it because, realistically, tea is a big part of my life, and it stained in moments. So that was that. I also got quartz instead, although I didn't like the marble look ones, I got a light grey in a honed finish that looks concrete-ish but is perfectly smooth and impervious to stains in the way that real concrete isn't, and I'm really pleased with how it turned out. I consoled myself by tiling my little entrance hall area in marble instead, and that looks good too, so I'm calling it a win. Really glad to see you are back, I've also missed your really witty posts. So glad to see you back, Virginia! Your kitchen looks lovely and I'm pretty sure that I'm gonna buy that same sink when I do my kitchen. I love it! Can't wait to hear about the rest of the house! 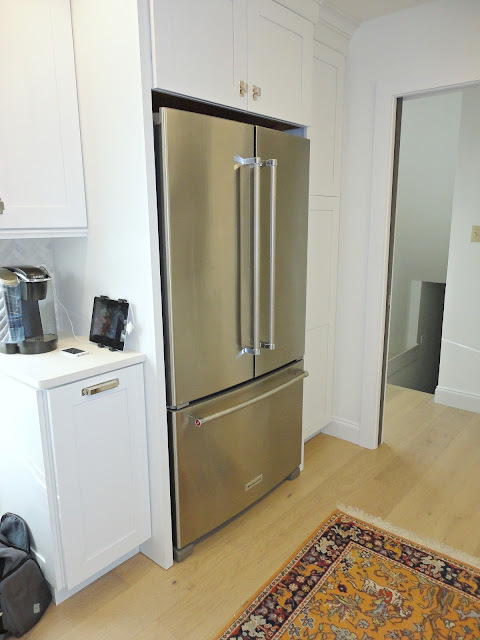 I have the same counter depth Kitchenaid fridge and I believe the same stove. Love the open feeling the shallow depth fridge brings to a small kitchen! Did a kitchen remodel recently, similar to yours, except went with black quartz counters and a medium brown floor. Very happy and think I will be able to live with it for years without having it feel dated. Happy for your victory! You're back! I was genuinely worried. I'm too out of touch to have IG so I just sadly checked here twice a week. So happy to see you've been busy creating miracles. Your kitchen makes me swoon. Can't wait to see the rest. Absolutely beautiful! Loved reading this post, welcome back! :) :) We have counter depth fridge as well. I hated it at first, but absolutely love it now and get overwhelmed by a full depth fridge. Looking forward to seeing how you tackle the rest of your home! Oh! Welcome back! so glad to see you again, and loved all the stuff about the kitchen. Particularly (strange, I know) the pocket door. I love them and you just don't see them in the UK. Well, I mean they are there, but sooooo rare. I am excited already about your next post, and so glad to see you around again. 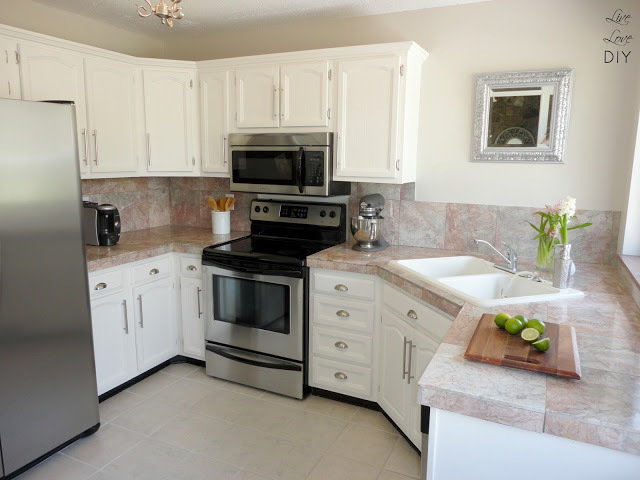 So nice seeing your new kitchen - the cabinets are really nice! I KNEW you'd be back...you've been missed. Beautiful kitchen and family...Ava growing so fast! Welcome back, looking forward to more, God bless! Girl, I needed this today. Thank you for another great post, they're always uplifting to me, I so appreciate your honesty and humor! Gurlaaahhhhh, like every other one of your projects, this new kitchen is the bomb.com!!!! I swear when I read your posts it feels like you're my long lost sista from anotha mista. I just hear what I imagine to be your voice in my head - go Virg. I'm happy you're back to the blog but I hope you do it at your own pace and not feel a pressure to deliver. Your followers love you and will be here patiently waiting for another catch up from you. I look forward to seeing all the great things you have in store. I'm jealous that you got to go see and check up on every step so frequently! We are in the middle of a kitchen reno right now and I've already made a bunch of mistakes in ordering and missed a bunch of little things.. My new kitchen is being built 3000 miles away and I am so the type who needs to micro-manage, but now when things go wrong I at least get to spread my arms and say "Well see? I wasn't here!" As far as the pendant lights I can't wait to see what you choose! I went with simple glass shells/brass fittings and Edison bulbs to hold us over while I scourer the vintage shops. Thanks for sharing and welcome back! You inspire! Wow! Such a transformation, and it is beautiful! Seeing you paint on your new counter looks like something I might do. Oh wait, I have. But I did use some newspaperunderneath , I'm not as brave as you. Or a whole lot clumsier. Can't wait for the next post. Yay! I love your posts--partially because you have such awesome taste and partially because the tone & personality make me feel like I'm catching up with an old friend. 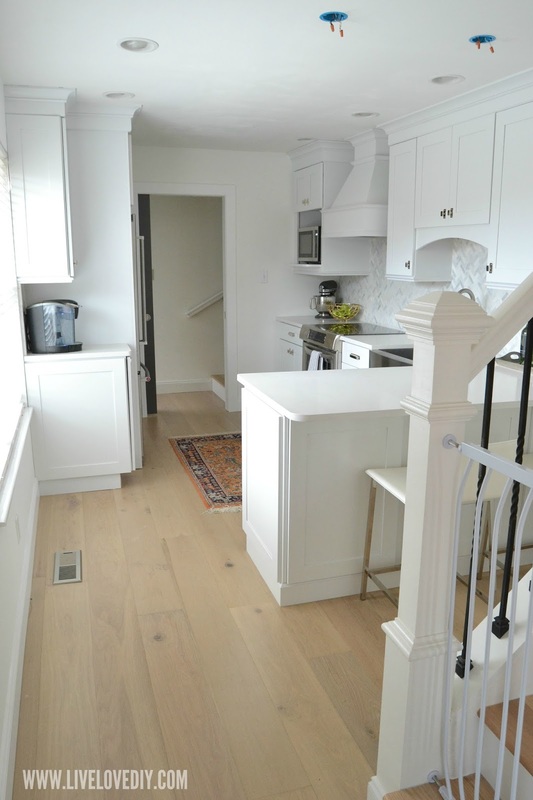 Your kitchen looks FAB--high quality and choices that will look great for years and years, Totally in love over here! Hi Virginia!! Congrats on the kitchen reno! It is dreamy!!! I just started following you on IG in case you disappear for a few months again lol. Love ya! Haven't seen you all in a while, but I'm back to visit and I do so love that kitchen. Proud for you and all your creative hard work! Blessings on your new home. Can't wait to see the rest! Peace! I absolutely love your kitchen! What an amazing accomplishment, and I love that you're so open and real about your life and your frustrations. Definitely looking forward to future posts. Hi, this reno is amazing!! How did you like using lowes? Was it priced similar to other contractors do you know? About to go through a similar process and don't even know where to start! I told myself I wouldn't comment on one of your posts until I could find the words to articulate how amazing I think you are, how keen I find your eye, and how inspired I am by your authenticity. 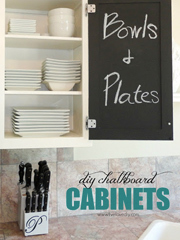 I find myself in need of commenting though because I am re-doing my kitchen and need to know the cabinet hardware you chose. I love it and would love to use it in my own kitchen. Any guidance (name and style) is appreciated. 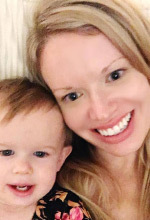 I know you are beyond incredibly busy with your little one running around, but I wanted to say thank you for all of the blog posts. We bought our first house (definitely a diamond in the rough to say the least) and I have been little by little working my way through it with DIY projects. I would have never even thought of trying without your blog to guide me and to also let me know it's ok when you mess up! Thanks again!